This is an awesome bit of kit for my new 15-inch MacBook Pro (Late 2016 with TouchBar) running macOS Sierra. 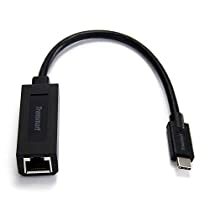 I bought this because it was only ten bucks and it promised no drivers required, which is in contrast to most competing USB-C ethernet adapters you will find on Amazon, and I hate 3rd-party drivers as they will eventually fall behind macOS updates. Promise confirmed! Plugged in to Mac and it shows up immediately as a new network interface named "USB 10/100/1000 LAN". Plugged in network cable and I really appreciated the red/blue lights for connection and activity, and they look cool through the translucent black housing (that's what my daughter said). The old Apple thunderbolt ethernet adapter and others have basically no easily visible feedback at all. I also did a speed test using iperf in various networking scenarios and got sustained gigabit transfer speeds (maxing out around ~950Mbs as is normal with overhead) in both directions. I did notice the adapter gets rather warm in use (on the circuit board side) but I did a several-hour burn-in and test at continuous gigabit speeds for hours and did not measure any loss of throughput. 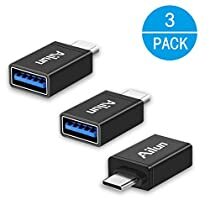 The final thing I'll note is that the official Apple solution for this adapter on their store is to sell the Belkin ethernet adapter for a price currently reduced to about 3 times the price of this adapter. And that adapter is sold out until at least Feb 2017!! So 3rd party solutions are your only options for a while, and I cannot be happier with this one. In fact I'm going to buy another one for travel and notice the price has gone up by three dollars since I purchased (my particular shipment came in a plastic package that had been opened by someone else already, even though it was supposed to be new, but I am keeping it anyway). 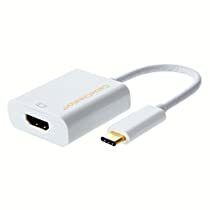 If you want a cost-effective and nicely designed (as far as dongles go) USB-C gigabit ethernet adapter that is truly plug-and-play for a Mac, look no further my friends. I used this on a 2016 15" MacBook Pro (w/Touch Bar) and it works flawlessly. It does get a little warm in use, but boy is it fast. I plugged it in to my Mac and it recognized it immediately with no drivers or installation necessary. Transferred 50gb data from my old Mac in about 5 minutes over Ethernet. I'd definitely recommend this to anyone with a 2016 MacBook Pro!